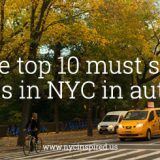 Today is Part 2 of our 7 part series Guide to NYC – on a budget, where I’m sharing my tips, tricks and all the info you need to know about taking your next trip to NYC on a budget! 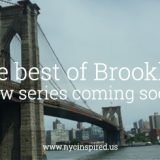 If this is your first time checking out this series and want to get caught up, read last weeks post about The best time to visit NYC. 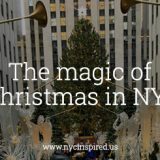 Todays blog “How do I get there?” is focusing on everything you need to know about the best NYC airports to fly into, taking the subway, bus or cabs and budget friendly tips on getting to and around NYC. So lets get started! 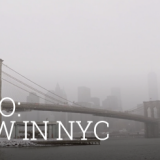 First, lets discuss getting to NYC. Assuming you aren’t driving, the easiest most efficient way to get there is on an airplane. NYC has 3 main airports in addition to many other surrounding ones I will cover. Under each airport description, I’ve listed a few of the best transportaion options to get you from the airport to Manhattan. I’ve included descriptions, approximate time it takes to get from point A to point B, and prices for each. To make it simple, Times Square is the Manhattan destination I calculated the following mileage from. 1. 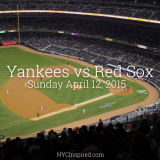 LaGuardia International Airport (LGA) – located in Queens, is only 9 miles from Manhattan. It is NYC’s 2nd largest airport, with 20 different airlines options, mostly domestic destinations, Canada and the Caribbean. Taxis -prices are metered and can cost anywhere from $30-$40 plus tolls to Manhattan (25 minute ride). The fares can vary depending on route and time in traffic. Bus or Subway – $2.75+, check out tripplanner.mta.info for specific routes and times for your trip. Subways do not go directly to La Guardia, so you will have to transfer from the bus to a subway. NYC Airporter (also in use at JFK)- $14 per person to Manhattan locations including Grand Central, Port Authority, Penn Station and Bryant Park. Buses depart every 30 minutes, have free wifi and each fare includes 2 regular size luggage bags and 1 carryon. 2. Newark International Airport (EWR) – located in Newark, New Jersey, is 16 miles from Manhattan. Just across the river in New Jersey, EWR offers 30 different airline options, a lot of which are international. 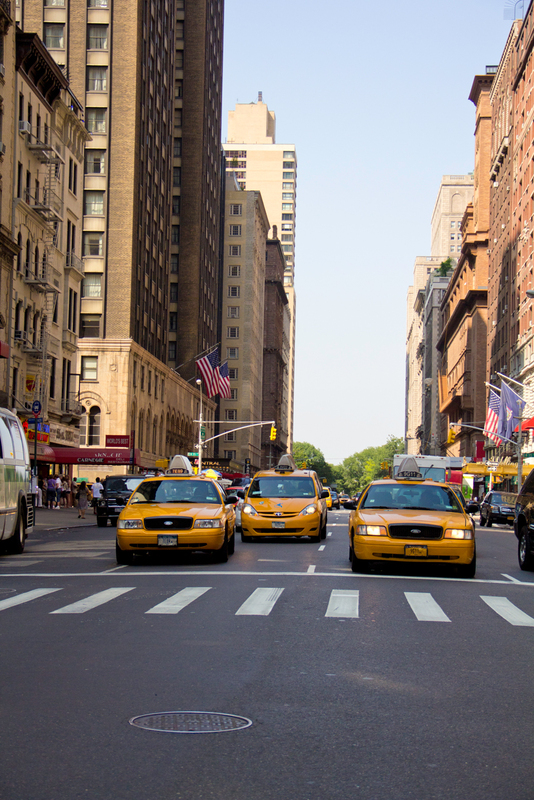 Taxis – the fares are metered, anywhere from $50-$75 plus tolls for bridges and tunnels (approximately 1 hour to Manhattan). Peak hour rates can be higher. Peak hours are around 6-9am and 4-7pm on weekdays, and noon-8pm on Saturdays and Sundays. NJ Transit via AirTrain Newark – $15. AirTrain links the airport terminal to New Jersey Transit. You will need to change trains to get from the AirTrain line to the NJ Transit line which will then take you to Penn Station (between 31st and 33rd st), The ride is anywhere from 45-60 minutes to Manhattan. Make sure you keep your ticket after exiting the AirTrain station, it is also your ticket for the NJ Transit fare. Olympia Airport Express– $16 (one way fare) from EWR to Port Authority, Bryant Park, & Grand Central in Manhattan (discounts for students, children & seniors). Approximately 40-50 minutes to Manhattan. You can purchase the tickets online through their website. 3. John F. Kennedy International Airport (JFK) – located in Queens, is 15 miles from Manhattan. This is NYC’s largest airport, offering more than 90 different airlines, most of which are international. Taxi’s are $52 flat rate (plus tolls) to any Manhattan destination (30-60 minuets ride). No additional charge for luggage and the price is per car load (up to 4 people) Taxis are always waiting outside every terminal exit. AirTrain – $7.75 per person train ride, gets you from JFK to Manhattan in less than an hour. You will need to change trains to get to Manhattan. You should be prepared to carry your bags as well as possibly go up and down stairs. This is a cheap option for those on a budget who don’t mind carrying their own luggage. Check out their website for more information. NYC Airporter Bus (also in use at LGA)- $16 per person, departs approximately every 30 minutes , 7 days a week to Grand Central Station, Penn Station and Port Authority, all in Manhattan. Buses have free wifi and each fare includes 2 regular size luggage bags and 1 carryon. Click here to check out their website for more information. If you are looking for a little adventure, check out some of these surrounding airports. Each of them offering different options including, car rentals, buses and train connections. 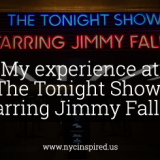 I wouldn’t recommend any of these options if you are just looking to spend time in NYC, but if you are wanting to check out some neighboring areas it might be another option for you. Westchester County Airport – (33 miles from Times Square)White Plains, New York – 6 airlines including JetBlue, Delta, United, US Airways and American Airlines. Walking – my personal favorite, (assuming your wearing comfortable shoes and the weather is good), this is the best way to experience the City first hand. You will notice so many more things and details you would probably miss in a car, or underground in the Subway. Subway or Bus – individual rides are $2.75, but if you plan on being in the City for a few days or plan to take multiple trips check out the different metro card options to see what fits you best. The subway will be faster if you are going a further distance, but if you have a lot of time the bus is nice because you aren’t underground and you can see everything going on outside. Click here to check out routes and maps of the subway and bus systems. Citi-bike -this is a bike share program in NYC offering thousands of bikes at 330 different locations around New York City. You can purchase a 24 hour pass ($9.95 for 30 min increments) or a 7 day pass ($25 +tax for 30 min increments). For both 24 hour and 7 day passes any use of the bike for longer than 30 minutes at a time has additional fees. Check out Citi bike’s website for more information. Uber – if you aren’t already familiar with Uber, this is a service connecting drivers with riders through an app. You select your location pick up point, select from available vehicle choices, get a fare estimate, and pay for your fare via the app, no cash is exchanged with the driver. Check out the website for more details or download the app if you plan to use this service. Lyft– another app based service matching up drivers with riders. A lot like Uber, you can get fare estimates ahead of time, and pay for the ride via your phone. Check out the website for more details. Staten Island Ferry – FREE – This ferry goes from Lower Manhattan to Staten Island and back 7 days a week. It’s a beautiful ride and takes you right past the Statue of Liberty. You also get beautiful views of the Manhattan skyline. Check the website for more details as well as departure schedules. 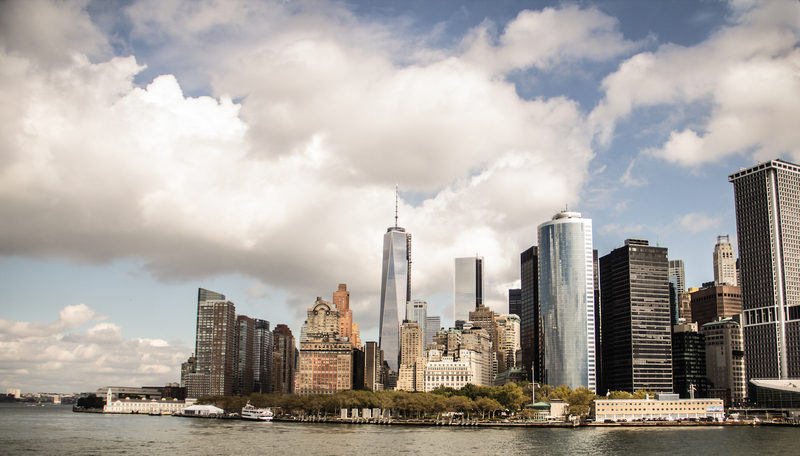 NY Waterway – offers several different ferries, both on the East River and Hudson River. Fares vary depending on your departure and arrival location. Check out there website for details. This is another beautiful way to see the skyline! NY Water Taxi– offers different locations and different boats. They offer an all day access pass in addition to individual passes incase you are wanting to get on and off through the day. Check out the website for schedules and fares. Lastly, here are my favorite websites for great travel deals. If you are looking to book your plane ticket, be sure to compare the following sites to make sure you are getting the best deal! TravelZoo – Every Wednesday they feature the top 20 travel deals. 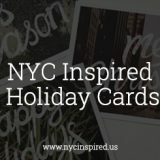 Be sure to check out different sections featuring NYC deals. Kayak – this site scans all the major airlines, giving you the best fares. It also allows you to choose flexible dates, as well as nearby airports. Fly.com – be sure to check out the fare calendar, it shows you the most affordable times to travel! Hotwire – this also has the nearby airport feature, and lets you breakdown the down the preferred time of day travel. Expedia – allows you to easily add a hotel or car rental to your flight price and book it as one package. Priceline – has a “name your own price” feature which I have personally used many times. You plug in the price you would like to pay and it will tell you if its accepted. When you “bid on your price” you are agreeing that if the price is accepted you bought it. It’s a great way to get deals! Orbitz – great for checking the cheapest fares, but also has a lot of crossover options like, flight and hotel, or flight and car, etc. Many of these sites offer some of the same features, but when planning a big trip I check all of them to make sure I’m finding the best deal. Well, today’s post was a lot of information! 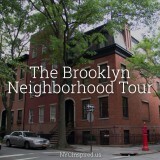 I hope it was helpful for you and I hope you are now one step closer to planning your next budget friendly trip to NYC! 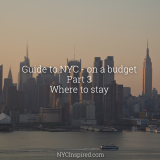 Check back next week for Part 3 of our series Guide to NYC – on a budget: Where to stay, giving you all the info on the best neighborhoods and hotels to stay at. Please let me know in the comments below if you have any questions. 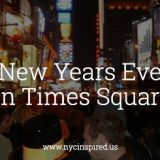 I hope I can help you take your dream trip to NYC!